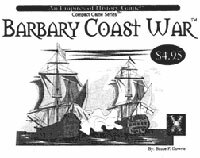 The Barbary Coast Wars is a low priced introductory historical board game covering the conflict between the United States and the Barbary Coast States in the early days of the US republic. In 1799 the United States agreed to pay an annual tribute to the Pasha of Tribili, the foremost of the Barbary States of North Africa. For centuries the Barbary States had been a major force for piracy in the Mediterranean and demanded tribute from many nations to allow for safe passage of merchant ships. The United States, no longer under the protection of the British Royal Navy, became a target of the Barbary pirates. The payment of tribute proved a short lived solution, when the Pasha turned around and demanded even more tribute. In 1801 the US refused an increase in tribute, which sparked the Barbary Wars; America's first conflict since its successful bid for independence. This 2-4 player game allows players to take command of the United States navy expeditionary force, Tripili, Algiers and Morocco. It is a fast paced game of naval engagements and boarding parties, raid and counter raid.